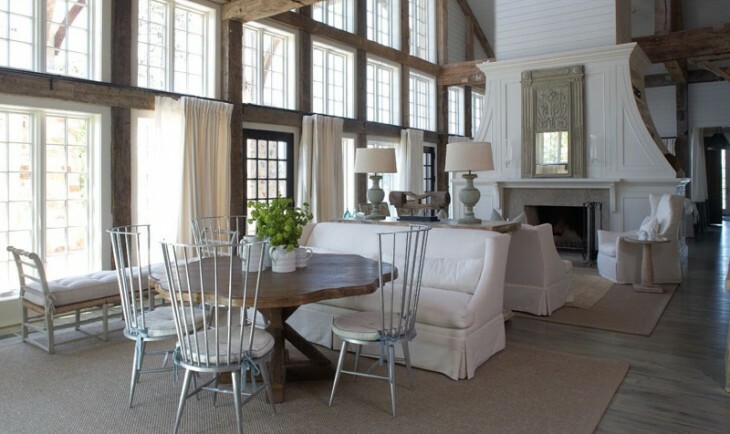 I first came across Tracery Interiors in Southern Living, and then the name would pop up here and there. I really enjoyed the work she did on a Southern Living Idea House in Georgia. Her style drew me in, and I decided to feature her beautiful work today. My first exposure to her design work was indicative of a bit more color. 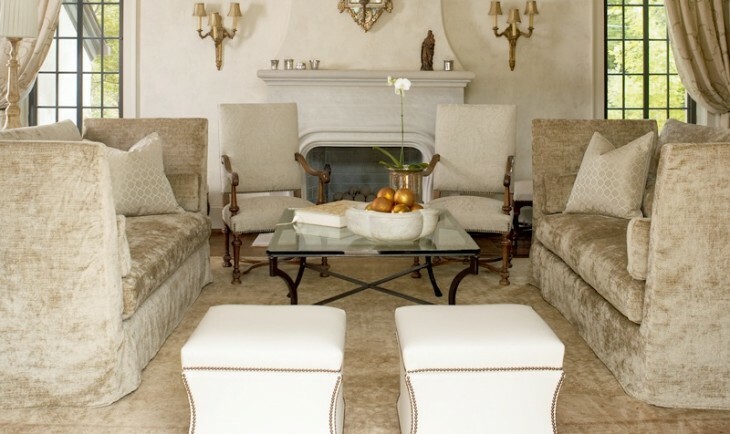 In the below photos we see her versatility and her use of neutrals to create soothing and comfortable rooms. 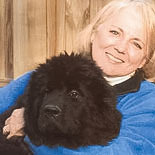 Her work is versatile and interesting, combining a European influence and Southern charm. This expansive lake home is on a point on Lake Martin in Alabama, near Birmingham. 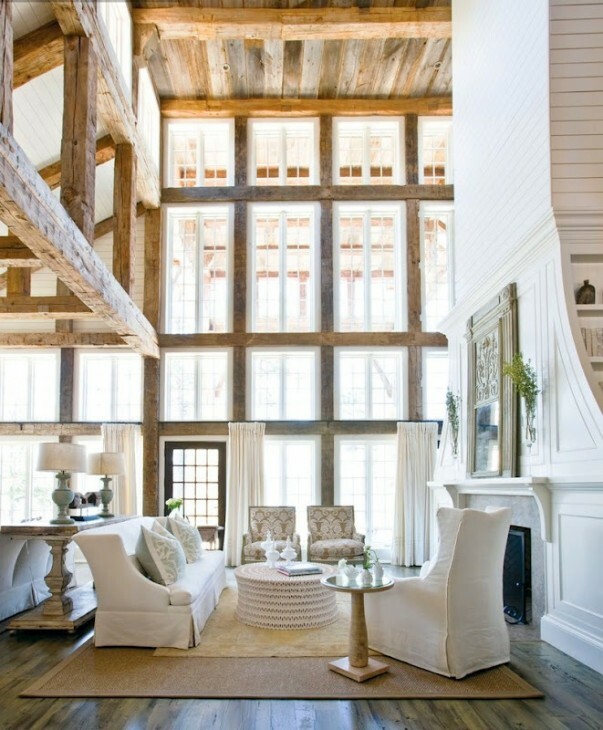 This room features beautiful reclaimed timber framing in this living room where the dramatic windows offer views out to the lake. 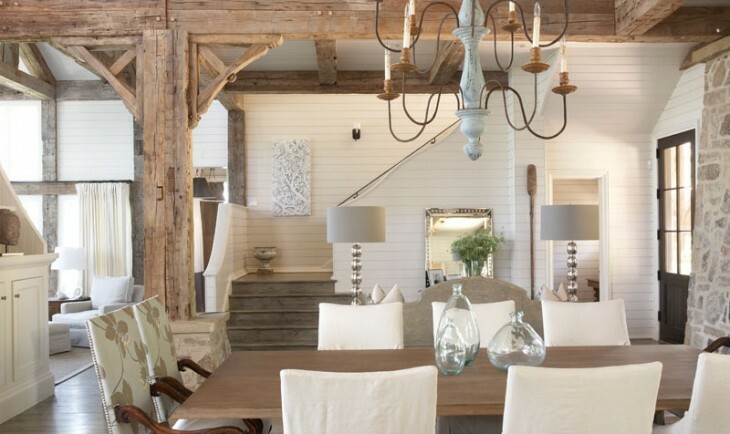 French antiques, galvanized metal and wood combine to create this light and dramatic space. In this house the designer used this basic color palette throughout. 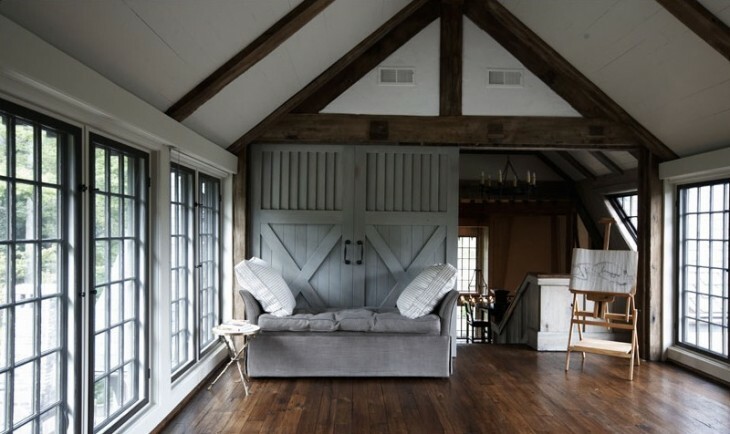 Rooms like these can appear both expansive and cozy at the same time. I really love the curved wood details on the fireplace surround. I especially like the color of the stained wood floors, in the same tones as the metal used throughout. Credit goes to the architect of this home. I am not a fan of windows piled on high just for the sake of having lots of windows. Here, the timbers bring it all into scale, and they are truly breathtaking. 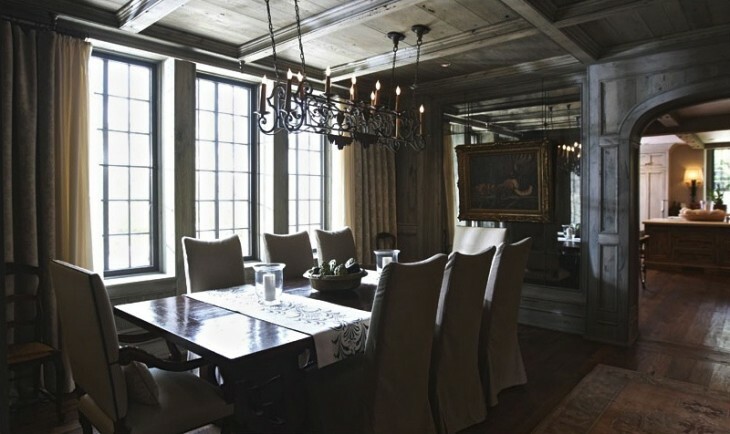 The wood plank ceiling further warms the room. The dining room is on the other side of the fireplace with stone columns at the far end. Here is another view, and the tapering columns lend visual weight to the room. Above you can glimpse the shutter and overlook details. I like the floral detail on the back of the chair, tiring in to the color of the chandelier and the art on the far wall. subtle but effective. 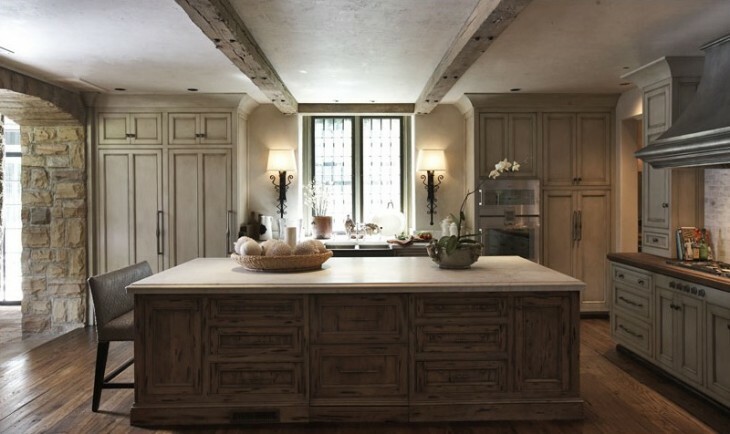 The horizontal boards in the kitchen is seen throughout the house, and brings the scale of high ceiling down to a comfortable feel.. 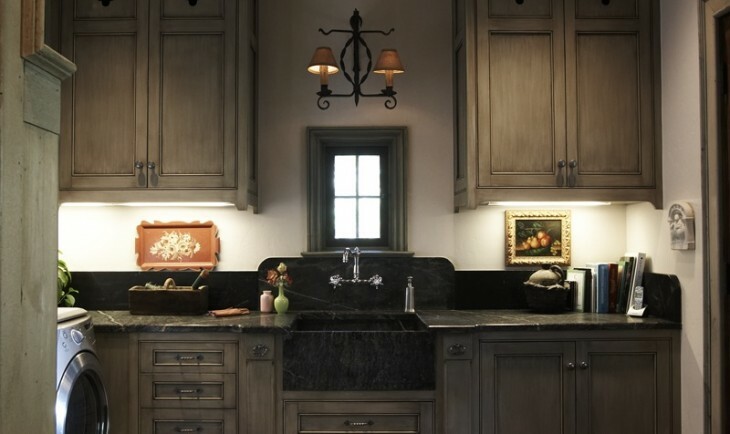 I like the two islands, which add versatility to multi tasking in this kitchen. 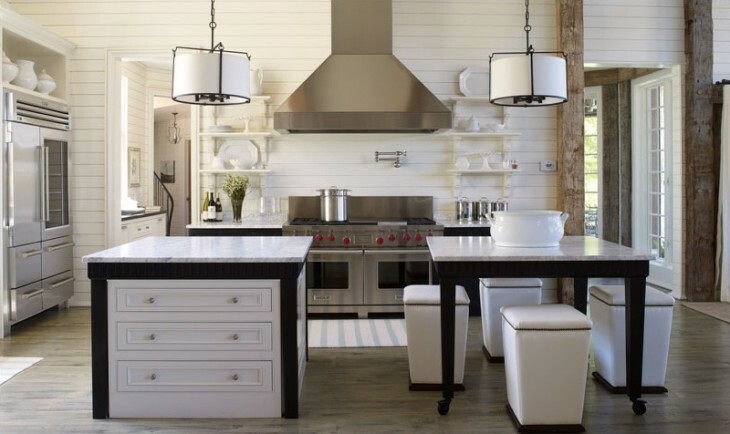 It is rather elegant with the black trim and the four white stools instead of the expected bar stools. Here we see the horizontal board treatment in a bedroom of calming white and tan. I really like the white detail trim on the drapery. 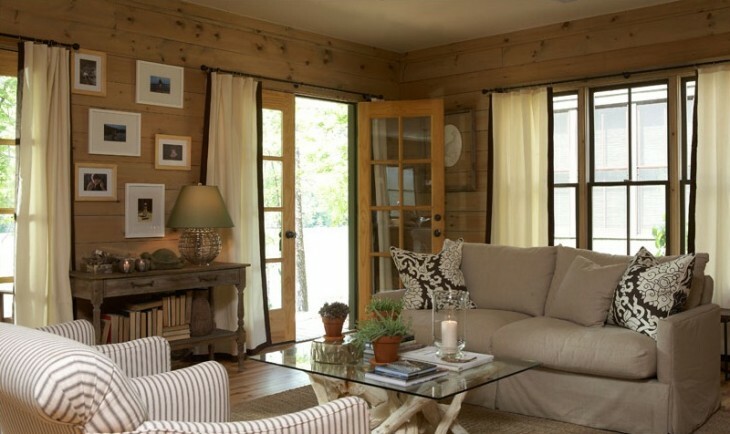 The natural grass rug is a good choice for a lake house. Another bedroom, this one with a patterned window treatment. Although the bed can be considered more formal than one might expect to use in this home, the textured fabric treatment brings it down a notch to balance it out. I like how the pillow fabric echoes the texture of the art above the bed. Here in another bedroom we see the use of a more intense color against the same white backdrop. 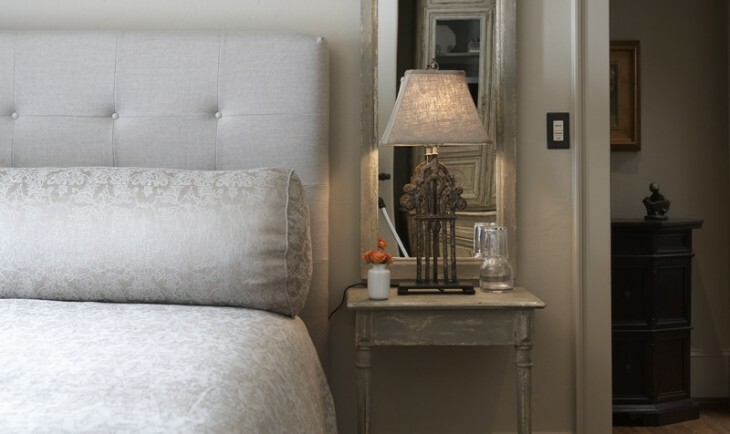 I find white sheets, especially at a home on the water, to be so delightfully refreshing…..crisp and cool! 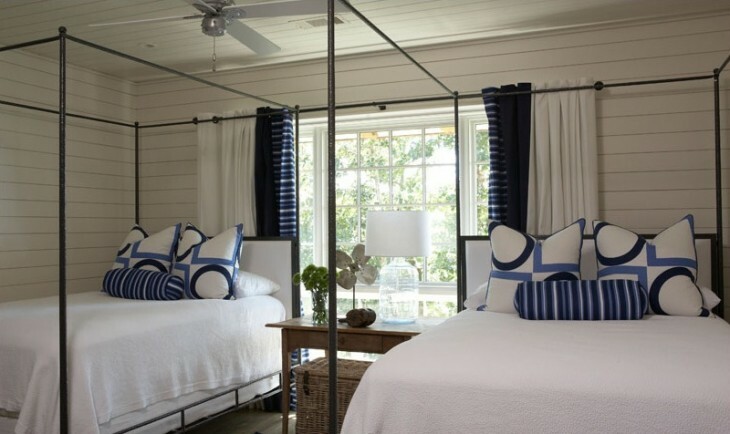 If you noticed…..the bed frames are connected, one to the other at the headboard end, and I think the drapes are hung from the front onto the connector and bed frame. Interesting. Another bedroom, all white and cream with a linen duvet cover, and Roman shades with sheer white tie up behind on the windows. The owners of this home could not bear to leave their neighborhood, so they collaborated with Tracery Interiors and Dungan Nequette Architects to redo and expand their spaces in order to accommodate their active family of six as well as a busy social schedule. This formal area will do the job. Pecky cyress panelling was used in several areas including the dining room, which can easily accommodate 10 diners. I like the oil painting hung from a mirrored wall, visually expanding the space. The kitchen is visible through the arched opening to the right. Soft and subtle. Their family of six can all comfortably gather in this space, which has plenty of storage. I like the thick stone arch to the left. Upstairs the kids now have plenty of space to hang out. Terrific space for them. 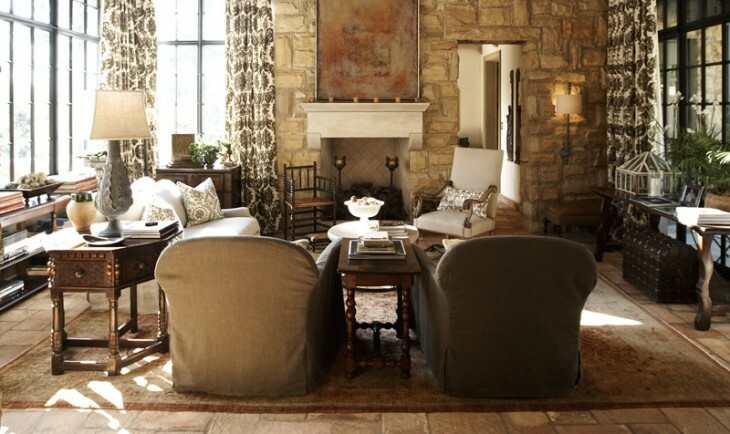 The cozy den off the kitchen with stone on the fireplace and the walls, and tall windows on both sides of the room. This room can put up with a lot of kid activity. Below are some other rooms designed by the firm. Who wouldn’t want a space like this to accomplish the laundry chores? I really appreciate a laundry room with a window to the outside world, even if just a tiny one. The laundry room is so often relegated to a corner space, often not even convenient. I think because forever, most architects were men who most likely did not do laundry, and just “didn’t get it”. More and more mirrors are popping up behind night stands. I like it, and have used it several times in design projects. I has to be the right scale and place for it to work effectively. This is a nice example. I also like the rolled pillow as the sole pillow on the bed. Elegant and refined. Allows the headboard to be seen. 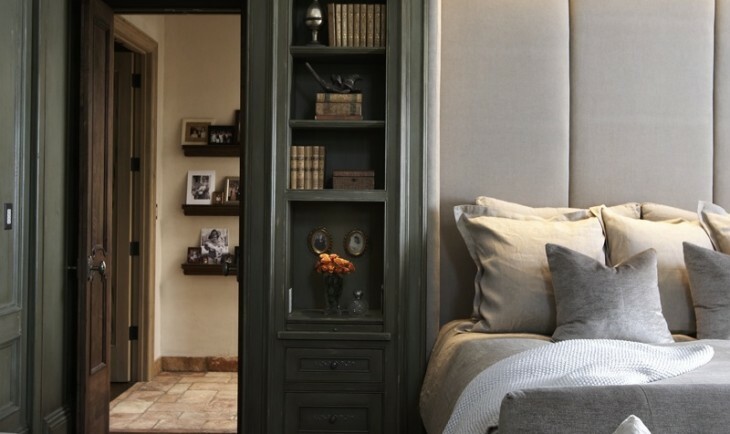 I like how the designer used these built-ins to frame the upholstered head board. The vertical seams add wonderful visual interest. Here the use of multiple pillows is more appropriate. This cottage is on Smith Lake in Alabama. All furnishings and fabrics were selected for ease of care. I like how she mixed vintage and contemporary pieces. The black edge trim on the curtains gives the room a finished look. This is the kitchen in the cottage above. I really, really like the stacked cased shelving on the left wall. It adds some drama and a whole lot of storage. The green color is a lovely foil to the stainless steel. 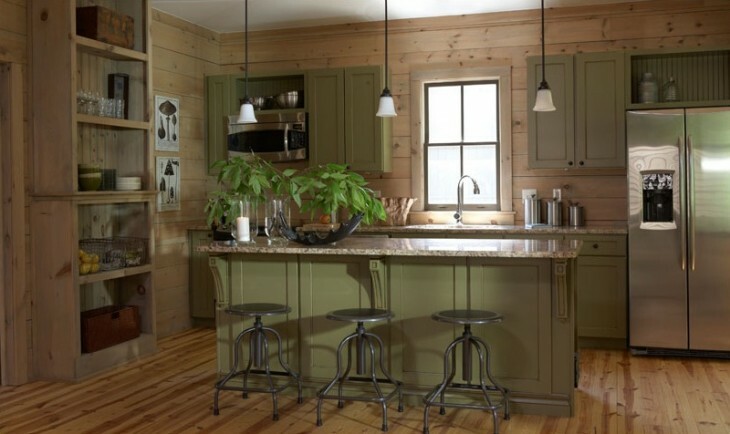 Color wise, this is one of the nicest kitchens I have seen for a cottage nestled in the pines on a lake. 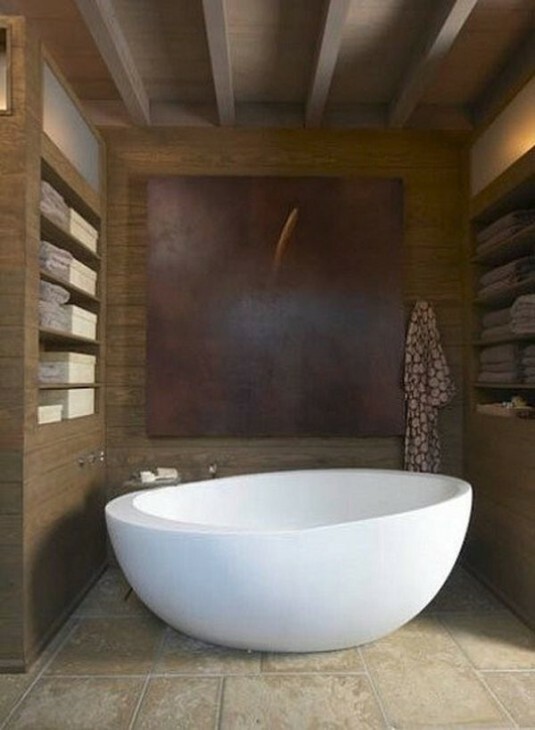 I like free standing tubs, especially when the shape is so sensuous. Set diagonally it looks like it was meant to be in this space. I don’t mind the lack of a window at all. Lots of linen storage only adds to it’s appeal. Thanks for stopping by. Another gray day in a string of them for days on end. I feel sorry for my neighbors across the street. Last week they had solar panels installed and lo and behold they will continue to pay the electric and propane company because we have not had any sun! I think sub consciously, or even consciously, I lean towards light color in blog posts sometimes, just to lighten the continuum of gray days. 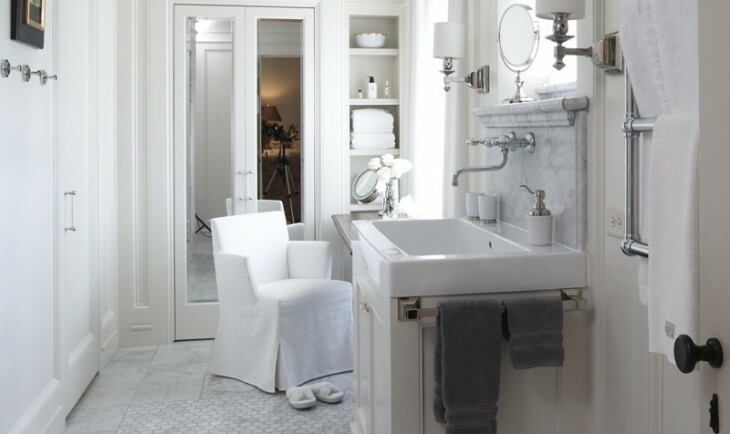 Warm and cozy is also good, but sometimes this girl needs white and bright! !